Try white water rafting without the raft - canyoning. 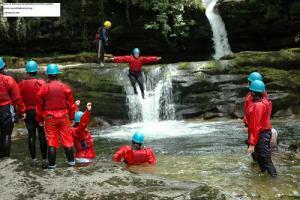 A fantastic high adrenaline activity with Adventure Britain - the canyoning experts and Wales' busiest canyoning company! The best way of describing our canyoning activity is white water rafting but without the raft. With our guides, you descend a stunning steep sided gorge by various ways and means. This can involve sliding down rapids, swimming down rapids, floating down fast flowing chutes and waves, walking behind some breathtaking waterfalls and of course jumping off those jaw dropping waterfalls. Our most popular activity and one you can't try to this standard many other places in the UK. Multi-award winning Adventure Britain offer adventurous outdoor activities for all ages and abilities. We are one of the oldest and largest activity companies in Wales having been operating for over 10 years. We are licensed with the Adventure Activities Licensing Authrority and been awarded the Investors in People quality standard. Contact us for more information. Canyoning is an adult activity. For a similar activity for children visit our gorge walking page.